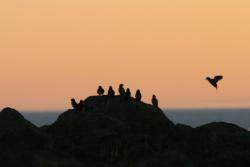 Akmaliighaq (least auklets) at sunset. Kitnkik, east of Savoonga, St. Lawrence Island, Alaska. Photo by Lisa Sheffield Guy. Seabirds are considered to be ecosystem sentinels; their productivity and populations rely on availability of zooplankton and forage fish species. Long-term data suggest that conditions seabirds experience during the non-breeding season might have a large impact on their reproductive output and survival. This project will help us understand the non-breeding ecology of seabirds. This need is especially pressing in areas of the Arctic undergoing changes in winter sea ice dynamics and increases in natural resource development. Using the data they collect, the team will develop a conceptual model of how warming in the Pacific Arctic will alter the region’s food web structure which is important for seabird conservation and management. The team will base operations out of Savoonga, Alaska and visit sites that are 5 km, 18 km and 30 km from the village. The remote village is located on St. Lawrence Island in the Bering Sea. Article published featuring PolarTREC teacher Wendi Pillars in her hometown newspaper, in Ashtabula, Ohio. Project Funded Title: Winter migration and carry-over effects in planktivorous and piscivorous seabirds breeding on St. Lawrence Island. Wendi Pillars, NBCT, has been teaching English-language learners in grades K-12 for over 20 years, both stateside and overseas, in civilian and military contexts. She also works as a facilitator with the Teacher Leadership Institute, guiding emerging teacher leaders in playing more consequential roles in shaping educational policies and practices. She is the author of "Visual Notetaking for Educators: A Teacher's Guide to Student Creativity," and a frequent contributor to EdWeek and other educational platforms. Wendi is a former Global Classroom Fellow through the State Dept, a Grosvenor Teacher Fellow, and teacher leader with the Center for Teaching Quality. An autodidact, she is focused on providing brain-changing, perspective-altering learning opportunities, and loves using creativity to empower her learners. Find her on Twitter @wendi322. Alexis Will is a post-doctoral research fellow at the National Institute of Polar Research in Japan, and a research scientist at the Institute of Arctic Biology, University of Alaska Fairbanks. She works with an international team of researchers studying how seabirds respond to changes in their environment. Currently they are exploring how seabirds breeding in the Northern Bering Sea interact with sea ice during the non-breeding period to understand how changes in sea ice extent may impact seabird distributions in the future. The main focus of my current research program is on the fundamental question: Can we predict population responses (range shift, adaptation or extinction) to an environmental change based on current phenotypic and biological age structures of natural populations of marine top-predators? Wow! Now you have yet another amazing skill to add to your already powerful resume. I never thought of this method of gathering important feeding data. Why are all the birds puking? Thanks Wendi for sharing your experience. I really enjoy this journal and learning more about your team members.